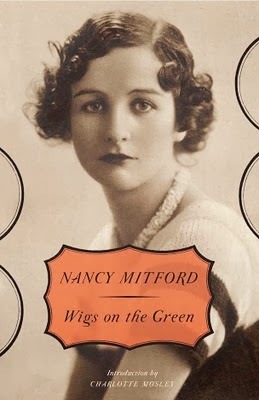 Nancy Mitford's Wigs on the Green was JUST republished in 2010 after being out of print for 35 years. Out of print despite the semi-enduring popularity of Mitford's novels. Why? Because it's pretty soft on Nazis. Oops. The introduction to the reprint says "When Nancy's published begged her to be allowed to reissue the novel in 1951, she refused. 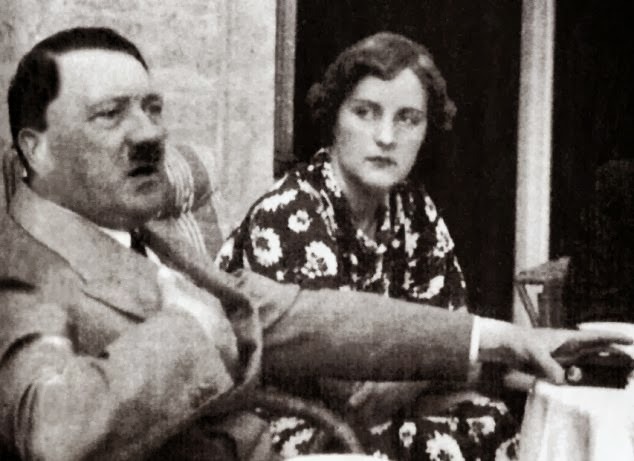 'Too much has happened for jokes about Nazis to be regarded as funny or as anything but the worst of taste,' she wrote to Evelyn Waugh, 'so that is out.'" The word "Nazi" is such a thing of its own now, it took me learning some German to find out they were National Socialists, with National being pronounced "Nahtzional." And to be honest, I'm still pretty much 'looks at you uncomprehendingly' when people talk about fascism/socialism/otherism. I know fascism is strict rules and a dictator, but socialism...is too? ANYWAY. 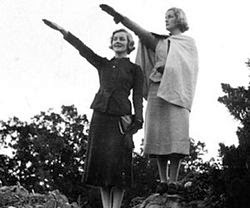 The reason this was all sticky for Nancy Mitford is that TWO of her upperclass British sisters were huge fans of Hitler. To the point that one moved to Germany because of him and was photographed with him. "I prefer national Socialism to the other sort, it is so much more romantic. Besides, I am inclined to think that the Western civilization we know needs putting out of its agony as soon as possible. It is old and tired, the dark ages are practically upon us anyhow, and I should prefer that they march in with trumpet and flag than that they should creep upon us to the tap of the typewriter." So there's a young man (think of Jack in The Importance of Being Earnest) who inherits some money and decides to marry an heiress so he will have MORE money and no longer have to work in his drudge of a job. He runs into his friend (think Algernon) who's all "Hey, there're some heiresses in this one little town," but then Algernon decides to go WITH Jack, and Jack is obviously not wanting this, because he is a stick in the mud, but together they go and they run into an heiress obsessed with Fascism and an heiress on the run from her wedding, and crazy Fascist-inspired shenanigans ensue. The yokels stood first on one foot and then on the other. Finally one of them removed a straw from this mouth and remarked that they had all enjoyed Miss Eugenia's speech very much, he was sure, and how was His Lordship's hay-fever? I'm usually not on board with 1920s/'30s types of books. Lord Peter Wimsey forever, but I've tried time and time again to get on board with Wodehouse, and I can't. It's all very "Ha-hah!" and "Mrs. Miggins" and "Bungo came down last week-end for some doubles" and ahhhhhhhhhh. But I found myself throughly enjoying it when done through the lens of Miss Mitford. To mitigate the weird Nazi sympathy, she creates an insane asylum for the British aristocracy, called Peersmont, which is built to resemble Parliament. "Lord Rousham...is on the sick-list again-no, nothing at all serious I am glad to say. He has just nipped up to the top of a big elm tree and is building himself a nest there. We don't stop him nowadays, one is never supposed to stop them doing harmless things of that sort. He won't catch a chill in this warm weather and the others like to watch how the nest is getting along. Rather fun for them really." It was decidedly an odd first Mitford, but her writing really is the most fun. I have vague plans of reading all her books now. MORE MITFORD.